The Band was started on March 21, 1994. It was formed to pay honor to our fallen brothers and sisters. The origin was based on two major motivating factors. The first and most important was the line of duty death of Officer David Douglas Sr. of the Lower Township Police Department. At his funeral service many departments and organizations from the East Coast sent representatives including pipers to pay their respects. The sheer emotion and reverence added by the pipes was a great inspiration to the local departments to create and maintain a local pipe and drum band. The second factor was The Cape May County Emerald Society. Many of our local officers had created this organization and the addition of a pipe band to enhance the image and celebration of our Celtic heritage was encouraged. Society Officers contacted NJ State Cultural Piper Joe Stearne and engaged him with the task of teaching and performing with the Society's Band. A small but enthusiastic group began on the practice chanter and actually performed at a family barbecue during the Irish festival on their chanters with Joe following with the tunes on the pipes. Slowly, but surely the transition from chanters to pipes began and the popularity of the band spread. 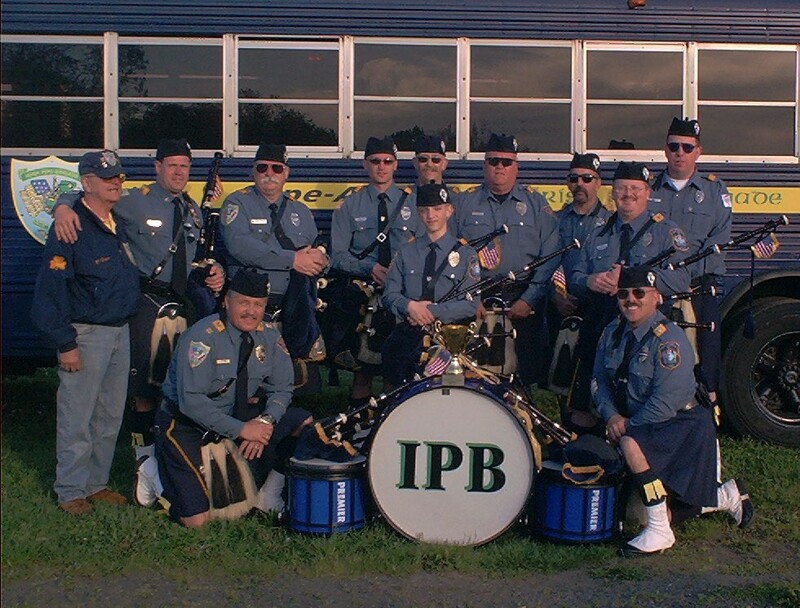 However, due to internal political struggles the band separated from the Society and became known as The Cape-Atlantic Police and Fire Irish Pipe Brigade. Since its inception, the bands' popularity has been nothing short of phenomenal. In a geographical area where pipes were scarcely heard in 1994, pipers were suddenly requested everywhere. In the first three years alone over 179 appearances were made. The two huge annual Irish weekends of Project Children(June) and the Irish Fall Festival(September) have provided for much of our exposure to thousands of people. One look at our appearance page will show you that we are increasingly busy. Our Pipe Major Kevin Tolan has now issued a new challenge to the band by adding competition. We have just started out in this arena and have now competed in EUSPB games. Our best performance was at the Richmond Celtic Games in October 1998. We finished 4th of seven Grade 5 bands and are thankful to the encouragement and knowledge passed on to us from the more experienced bands we have met. Even though the competition is stressful we still manage to find time to enjoy the situations and play to the crowd for fun. May 4th, 2002, Our first trophy finish in competition: 2nd Place at the Monmouth Celtic Games at Red Bank, NJ-10 bands. in Grade V EUSPBA Standings. In 2003, we were moved up to Grade IV competition. Right away we discovered that the demands at this level were more challenging. We continue our endeavors and look forward to this year's coming season. In March of 2004 we celebrated our 10th year together with an Irish Hoolie at Tucker's Pub in Wildwood. Past members and friends of the band were in attendance. Pipe Major Tolan put together a collection of videos from the very beginning to present. Man did we stink. However the latter videos left us encouraged to keep at this. Here in the present its 2013, 19 years, and we are still going strong. Members have come and gone but the core is still active and we carry on. Some of our favorite appearances are at the annual Robbie Burns dinner in Cape May and performing on The Wildwoods' Boardwalk weekly in the summer. We've been to Savannah twice for their St. Patrick's Day Parade and its the best. We are looking forward to going again. Pipes up, let's go!! We are always looking to expand our membership and new pipers and drummers are welcome. Contact our Pipe Major Kevin Tolan if you are interested in taking up the chanter. Color Corps personnel are always in demand as well as shift work doesn't allow for full attendance at functions by everyone.